Their findings have been accepted for publication in an upcoming issue of the Astronomical Journal, and will be presented on October 18 at the American Astronomical Society's Division for Planetary Sciences annual meeting, held in Pasadena. The tilt of the solar system's orbital plane has long befuddled astronomers because of the way the planets formed: as a spinning cloud slowly collapsing first into a disk and then into objects orbiting a central star. Planet Nine's angular momentum is having an outsized impact on the solar system based on its location and size. A planet's angular momentum equals the mass of an object multiplied by its distance from the sun, and corresponds with the force that the planet exerts on the overall system's spin. Because the other planets in the solar system all exist along a flat plane, their angular momentum works to keep the whole disk spinning smoothly. Planet Nine's unusual orbit, however, adds a multi-billion-year wobble to that system. 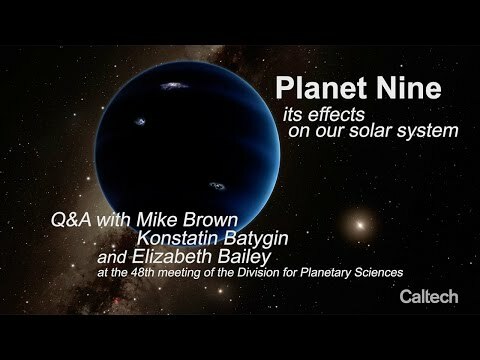 Mathematically, given the hypothesized size and distance of Planet Nine, a six-degree tilt fits perfectly, Brown says. The next question, then, is how did Planet Nine achieve its unusual orbit? Though that remains to be determined, Batygin suggests that the planet may have been ejected from the neighborhood of the gas giants by Jupiter, or perhaps may have been influenced by the gravitational pull of other stellar bodies in the solar system's extreme past.